The fourth quarter saw it turn a profit for the first time, but user numbers stagnated. Back in October, Twitter promised that by the time the fourth quarter rolled around, it would be profitable, or just about. Since then, however, the company lost its de-facto CEO and continues to raise the ire of figures on both sides of the aisle. It comes as something of a surprise then, that Twitter has managed to turn its first ever quarterly profit of $91 million. If there was ever cause for optimism that the 12-year-old company will survive, it's the fact that it's now making money. But for every silver lining, there's a grey cloud, and Twitter can't rely upon rosy user numbers to bolster the good mood. In the second quarter, the company claimed that it had lost around a million users, but later admitted that its math was wrong and the figure was much worse. Three months later, and figures had rebounded to 330 million monthly active users. In the fourth quarter that number has held steady, with a million-user fall in US users cancelling out the commensurate increase internationally. That still represents 12 million more users than this time last year, but three consecutive quarters of fairly flat figures will make uncomfortable reading for Twitter's leadership. Twitter blames the fall in numbers on two things: a change to Safari's app integrations, and the project that's euphemistically-titled "information quality efforts." The latter is, unsurprisingly, the project which is attempting to purge the site of automated accounts that are designed to spread "malicious activity." CEO Jack Dorsey is pledging that the company will continue to attempt to crack down on automated accounts and otherwise "poor-quality usage." 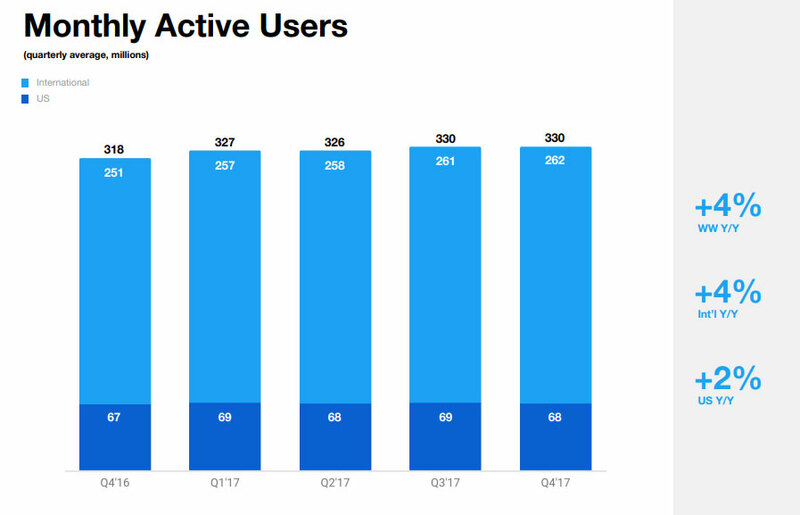 If there's reason for optimism, it's that (otherwise-secret) daily active user figures have increased by 12 percent year-on-year, so the people who use Twitter are using it more. It appears that the 280 character limit change has had the desired effect to bring folks back to the platform who were frustrated at having to be so succinct. In addition, Twitter believes that the relatively-new ability to thread tweets has pleased Seth Abramson plenty of users. Twitter has also seen its revenue increase internationally as it sees a small decline in money coming in domestically. In the US, where it has 68 million users, advertising revenue fell 8 percent year-on-year to $406 million. Overseas, which has 262 million users, ad sales increased 17 percent to $326 million. Twitter's 2017 financial year, as a whole, can't be entirely saved by a profitable quarter, and overall yearly revenues fell 3 percent compared to 2016. On the positive side, net losses overall were down to $108 million, compared to $457 million in the previous year, although all red ink is still red ink.